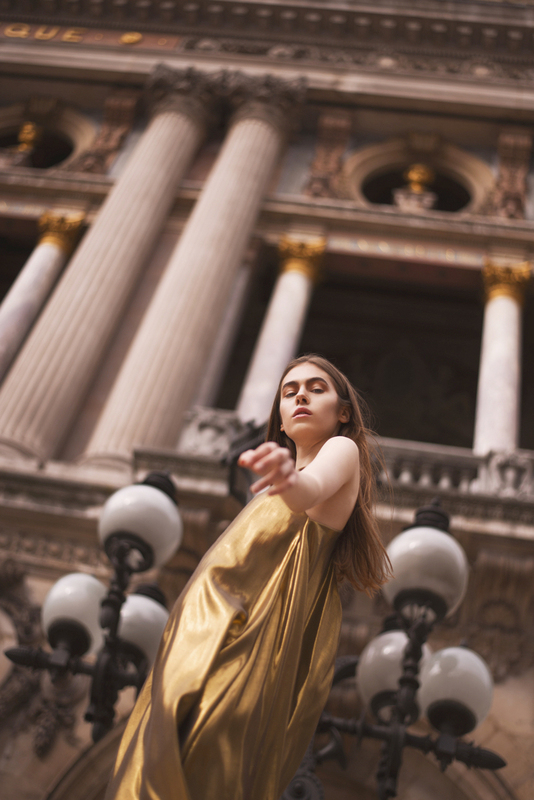 Dismantling Opéra with a loud silence, casting a spell on it while the innocent ritual of Parisian promenade happens propelling an awaking in a meditative clash. Adela is the silence that resonates in awakened souls and inside conversation of many dialogues dancing and recreating the mind. A light wool brown toga paired with a bared shoulder looming out a blouse made of silk that was meant to be for ties. A dense yellow knit skirt in harmonious contrast with a hand woven Potosí-rebozo fringe blouse. A flouncy and rebel orange dress hybridized by one sleeve scarf handmade in the traditional way of the Tzoltzil Mexican community. An eclectic mixture of free shaped urban garments with a traditional textile heritage communing across place Vendome, the symbol of luxury and military force. Flagging against war memorials broken and stretchy postures, suspended and agitated steps as caressing the air. Flirting with the idea of a contemporary urban pray. Praying on the wisdom of youth in new generations with old souls. Elegance being daring, power being caring. An honest meditation on a not so fairy fairness. The nebula of the thoughts wise enough to let us know that air amongst our hands is the most precious luxury we have, we breathe.